As a program of the Area Agency on Aging, the Senior Nutrition Program aims to enrich the lives of older adults by providing nutritious meals and services that promote dignity, well-being, and independence. Meals are prepared fresh daily by local caterers and are designed to provide 1/3 recommended dietary allowance for older adults. 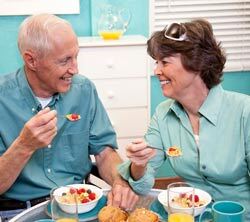 The Senior Nutrition Congregate Meal Program is designed for persons 60 years of age and older and their spouse (regardless of age). Meals are served daily (Monday- Friday) at local senior centers, community centers and/ or subsidized housing units throughout the region. The purpose of this program is to promote the health and wellbeing of older adults by providing nutrition as well as opportunities for health education, social interaction and recreation. For more information about local congregate meal programs contact your local senior center or the Senior Nutrition Program at 252-426-7093. The Home Delivered Meal Program is designed for homebound older adults (60+) who are physically or mentally unable to obtain or prepare their own nutrition. 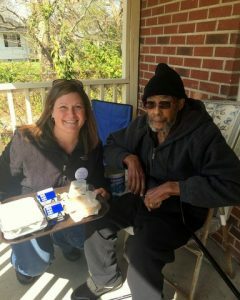 A noontime meal is delivered to over 300 homebound individuals daily (Monday-Friday) by a network of dedicated volunteers. The purpose of this program is to promote wellbeing and independence which will allow our clients to remain independent and in their homes for as long as safely possible. For more information about home delivered meals nutrition program, please contact 252-426-7093.